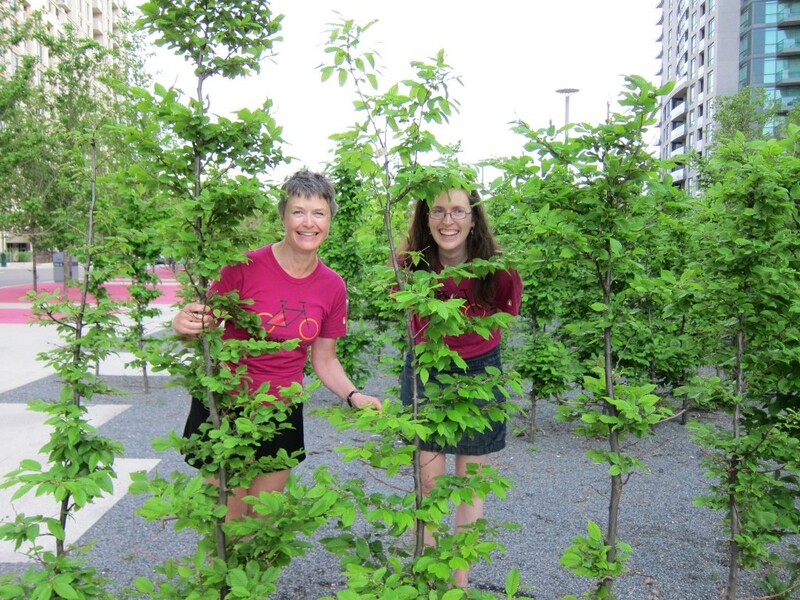 Janet Joy Wilson and Amanda Lewis frolicking in the trees at June Callwood Park. It was in a coffee shop in the summer of 2014 when Janet Joy Wilson and Amanda Lewis conceived the idea for The Reading Line. They both work for Penguin Canada, and wanted to bring two of their favourite things together: books and bikes. Combine that with the second anniversary of the Fort York Library, Jane Jacobs's 100th birthday on June 4 (plus Janet Joy's love of alliteration) and BAM! you have this year's iteration The Reading Line: Books on Bathurst. 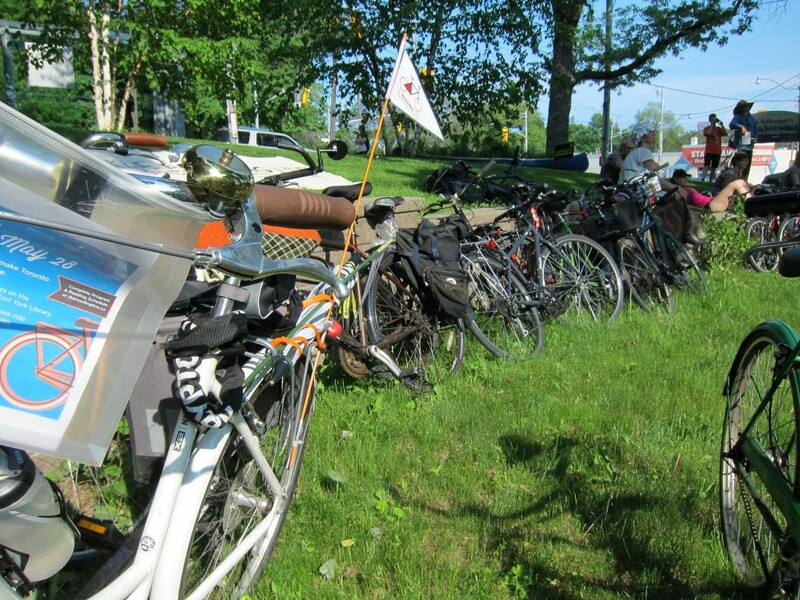 The popular group ride, now in it's third year, started at 3 p.m. this past Saturday, May 28, at the Fort York Library, where participants heard from speakers ranging from poets and authors, to politicians and public workers. Ted Belke from the Toronto Public Library spoke about the building itself, giving a rundown of the architecture, the design, and future plans for the already-condo-filled neighbourhood. "The [area to the north] will not be another condo," Belke announced and the crowd erupted in cheers. The building itself has some nods to the past: the stairs and the ceiling are made from the same wood that the docks were made from before the lake was filled in to create Queens Quay. Words from the journals of Susanna Moodie—which many of you bookish people might be familiar with from Margaret Atwoods Alias Grace—run along the outside wall. Councillor Cressy talking about the "not another condo" or, as it's officially/actually known, the Mouth of the Creek Park. 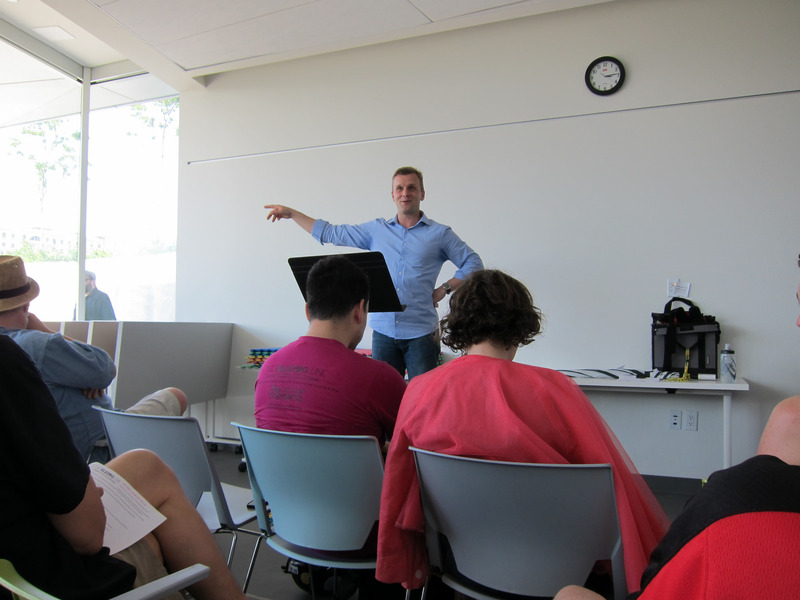 Joe Cressy, councillor for ward 20, spoke about the social infrastructure needed to make dense urban spaces liveable. 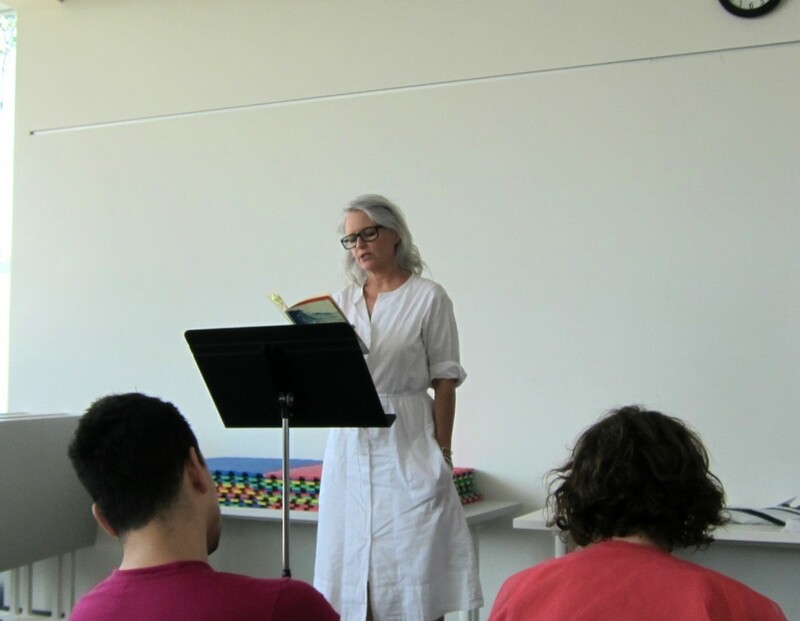 Tanis Rideout reading from her book Arguments with the Lake. "There's always something great that happens when you intersect arts and community together," Rideout said. "Artists tend to be paying attention to things, and it provides a different intersection to look at a space." 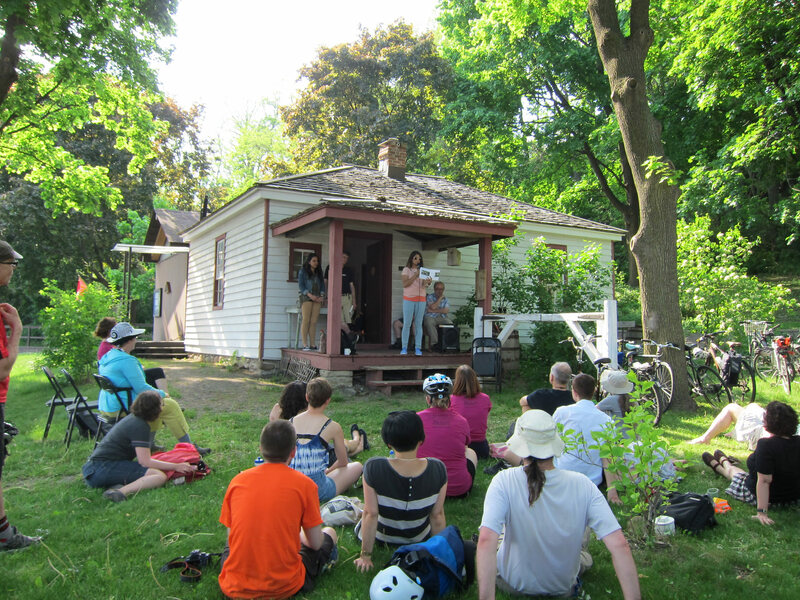 The next stop on the Reading Line ride was the Tollkeeper's Cottage Museum, where Joe Mihevc, councillor for ward 21, spoke alongside the manager of the museum, Denise Pinto from Janes Walk, as well as John Lorinc and Fatima Syed with their book, Subdivided. Bikes rest at the Tollkeeper's Cottage. Mihevc spoke about tolls and how in the past, people paid for the use of the road right in that location, where the museum is. Davenport had about seven tolls, and Yonge had up to 12. He briefly mentioned the possibility of Toronto using this method to pay for roads, but as we all know, what downtown councillors want isn't always what council approves. Denise Pinto, executive director of Janes Walk, spoke about her grassroots, community-oriented project that's been happening for almost a decade. She told us a story about Zack and Halim, six-year-old boys who led a Janes Walk to show where the best spot was to play sticks. Other walks run by her organization have included ones led by Syrian refugees, and another led by the Farsi community in the Bathurst and Finch area. Denise Pinto reading from Jane Jacob's book The Death and Life of the Great American City. John Lorinc, editor of The Ward, and Fatima Syed were there to talk about their new book Subdivided: City-Building in an Age of Hyper-Diversity. Syed's chapter focuses on who creates the spaces, and how city zoning is only accessible to select people. She began by talking about the time she and her mother tried to find a mosque in Mississauga for the first time, and ended up in the middle of an industrial zone with no signage indicating a mosque was even in the area. "My chapter explores the idea of creating religious spaces in the city," Syed said. "Oftentimes a community's identity is reflected in the skyline, and if all the different communities can't see themselves in the skyline, what does that mean?" 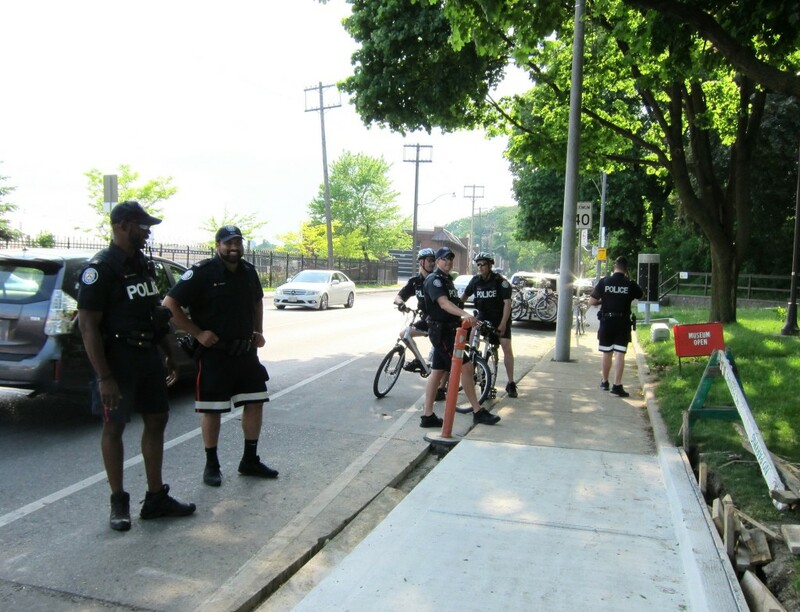 Police then escorted the group back down Bathurst to June Callwood Park, where Mike Layton, councillor for Ward 19, and Jacquelyn Gulati, Manager of Cycling Infrastructure and Programs at the City, spoke about the need for better bike infrastructure and the changes made from the original 2001 plan. Nice work if you can get it. 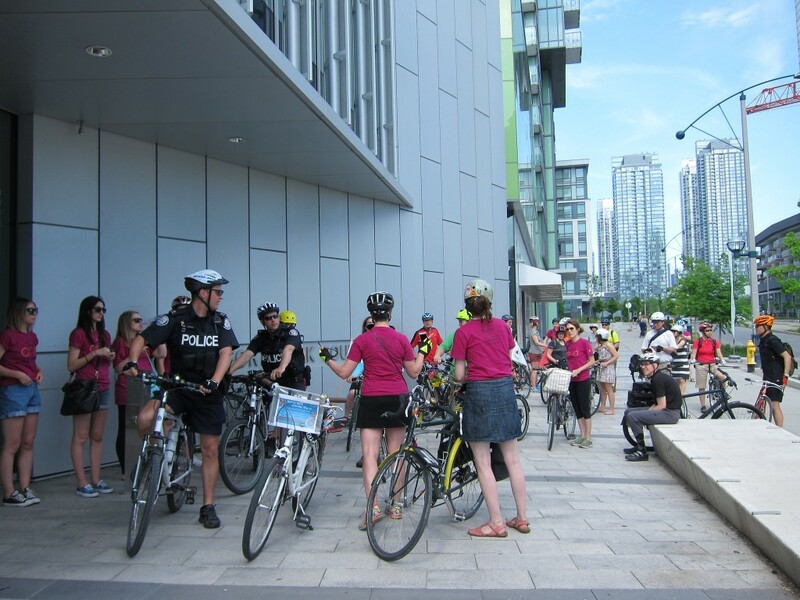 The police officer I spoke to said there was a waiting list to become a bike cop. 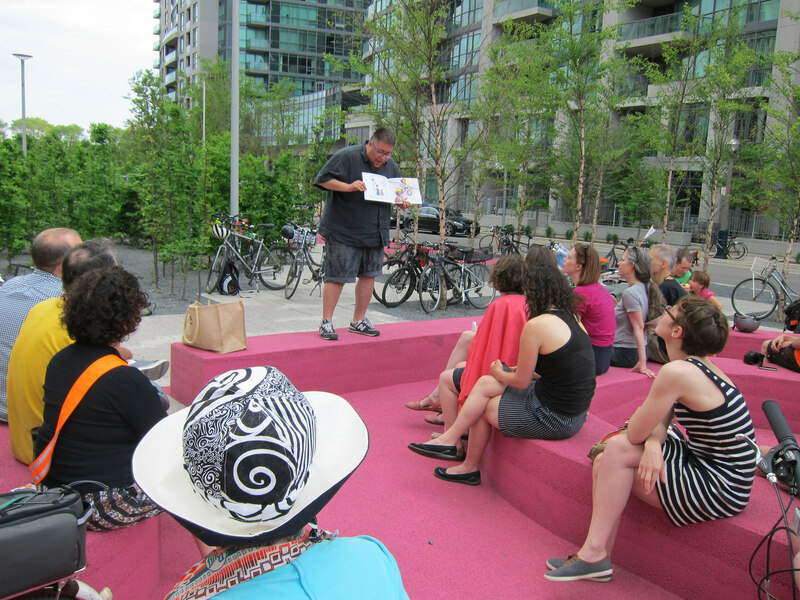 Bear Bergman was the next speaker, and amidst the ruckus of the nearby Gardiner, the airport, and rowdy Jays fans on their condo balconies, he read Catherine Hernandez's book M is for Moustache, which was published by the small press he runs called Flamingo Rampant. Despite all the noise, everyone heard "B is for Bike" (and cheered of course), and managed to learn how to say "Happy Pride, hooray!" in sign language. S. Bear Bergman reading from Catherine Hernandez's M is for Moustache. The final speaker of the event was Anne Michaels. Unfortunately, her voice was too quiet to be heard unless directly in front of her. But thankfully, I did catch some of it. The Toronto Poet Laureate and author of Fugitive Pieces told a heartwarming story about the last time she spoke to June Callwood. And, she said: "It's fantastic to have gatherings [like the Reading Line]. People coming out together to do the things they love, what's better than that?" Not much, I would say. See below for some Bike Spotting at the Reading Line 2016. I asked "Why are you riding the Reading Line?" "I think that there are aspects that we need to celebrate and that we need to honour, remember - and remember how important these aspects are in our lives, and join together to support them." 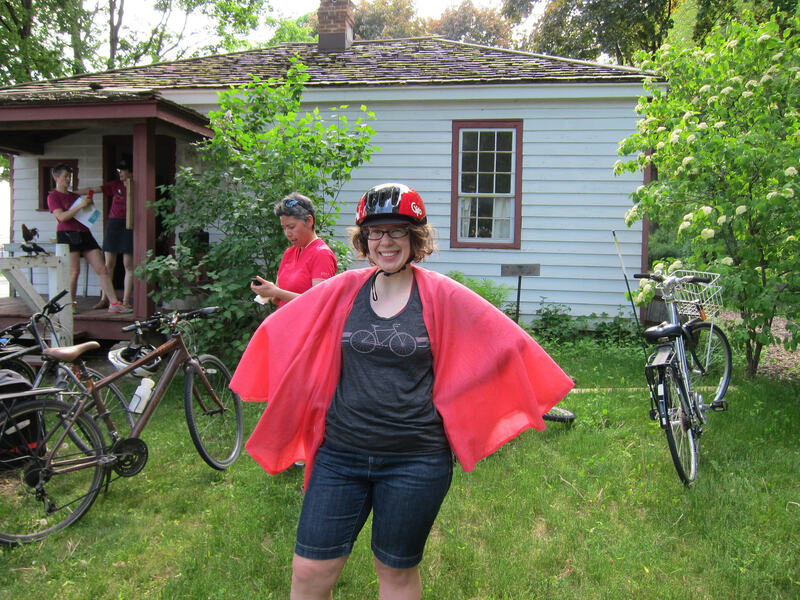 "I wear this pink sparkly cape because it makes me not have to take things too seriously on the road. It makes me laugh, and it makes other people laugh. I think anything that brings cycling out of this idea that cycling is a fringe activity that only people do in like, tight spandex, is great. Events like this help with that." 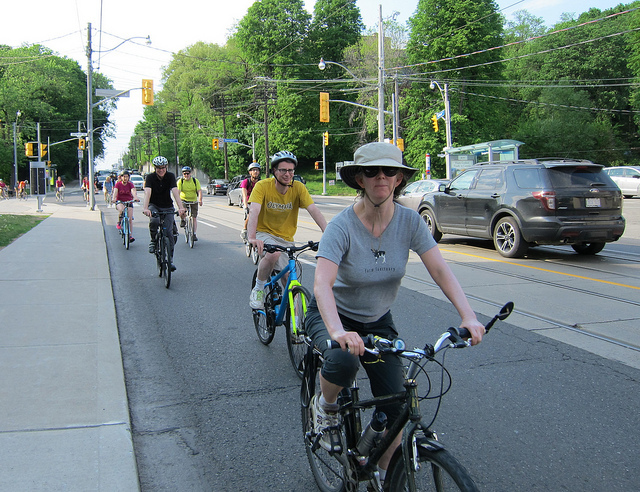 Bike Spotting: Have you heard the city is planning more protected bike lanes?